Well, it's official! 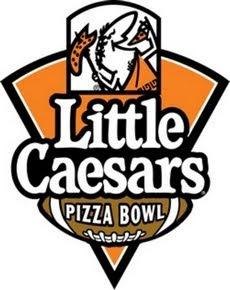 The Motor City Bowl is now the Little Caesars Pizza Bowl. And unfortunately, they spurned all suggestions from TOSSS, removing all references to the Motor City and killing the brand identity that had been established for over ten years. Funny thing is, this happened even though Ford remained a sponsor of the game! Tells us something about the power of the auto industry, huh? It's possible however this is exactly what they wanted to do. While those of us with Michigan connections often look fondly on the Motor City Bowl, (I have been to almost every Motor City Bowl ever played) it was viewed as a much lower prestige game nationally, despite its Big Ten tie in. There could be many reasons for this, including that the Big Ten often doesn't actually send a team to this game, that Big Ten football has a lower national appeal recently, that the bowl payout isn't huge, and that it takes place in the City of Detroit, not exactly a "glamorous" city in the eyes of most Americans. Image courtesy of the Detroit Free Press.